We will be opening in a new location soon. Stay tuned for details. We pride ourselves on delivering appetizing options for meat lovers, vegetarians, vegans, pescatarians or any other AN-ism diet. Everything is made to order. The food here takes a bit longer than most other establishments who focus on speed of service. We don't use a microwave. We don't use a deep fryer. We saute / pan fry everything exclusively in avocado oil. Some dishes also include sesame oil. Chicken wings and chicken skin are fried in chicken fat. We highly recommend that anyone with time constraints call and order ahead of time. We can have your meal ready when you arrive. Lemon grass- We would like to start serving some grilled satays with lemon grass, not bamboo sticks, for the skewers as it should be done. Mustard greens- some favorite varieties that we've tested and will incorporate into some salads and also in some sandwiches when we start serving those. Pumpkin- we don't currently have the space to grow our own Kabocha squash but we will grow a variety of pumpkin for harvesting huskless seeds to be roasted and served in our house salad. Shallot Greens- We had these last year in a limited amount and they worked out great, This year we will have an ample supply. Snow peas- purple and yellow varieties of snow peas will be worked into some of the dishes. Salad Herbs- mint, pak kayang, bpai yeera, vietnamese mint. these herbs we apply heavily in salads and they compliment the dressings well. GARLIC: Our fresh garlic is California garlic. OIL: We saute exclusively with avocado oil. Almost all of our dishes are sauteed with avocado oil. For a few dishes we use sesame oil. For a few dishes we use chicken fat or fry chicken with chicken fat. For some dishes duck fat is utilized and in a few others we utilize pork fat.
. Thai tapioca dessert, Kanom Toowai, is sweetened with cane sugar, palm sugar and pandan (bpai dtoiy), a plant with juicy/softer than normal fronds and more complex sugars. At Bon Palay we don't just boil onions and vegetables at the last minute before a dish is served to act as filler or bulk. We caramelize onions and sweet peppers in the highest quality oil and bring out their natural sweetness which contributes to the all important balance of flavors. This allows us to use less or, depending on the dish, completely remove the need to add cane sugar or palm sugar or a sweet black soy sauce as would traditionally be done. August 2018 Update: We may have found a suitable piece of land with a suitable and equitable arrangement for growing enough of these things for Bon Palay this fall. basil- The Mang Luk, trial is going great. They are taking well to container growing. Peppers- We successfully transplanted many of the thai chili varieties, pimientos de padron, pequin, tepin, de arbol, lemon drop, serrano, jalapeno, ...more chilis than you can shake another stick at. What we call the THAI TABLE CHILE is already putting out fruit and pictured at right. Lemon grass- The lemon grass is growing much slower than we expected. It may not be feasible this year to grow our own as we anticipated based on last years trial. Mustard greens- the few seeds we have for our favorite variety are flowering and pumping out more seeds for us to then seed enough for a steady supply of mini mustard greens. Shallot Greens- we're slow to grow out an ample amount of these greens. all planting work has until now been put into transplanting the tomatoes and peppers. These will be available soon. Salad Herbs- pak kayang did not take well enough to container growing as we expected. We're working on it. Coming Soon in a small trial amount this year. We'll be saving as much seed as possible from this batch and growing some out this fall under lights if these don't move well to indoors. Most will be saved for next spring so that we can offer fresh table chile for anyone wishing to add their exceptional heat. there are many basils in thailand. each one with its own name and identity. in isaan region mangluk is essential for curries without coconut milk. and yes, we are recycling our coconut milk cans here as grow pots and the irony isnt lost on us. Steamed Dumplings. Served with dipping sauces and toppings. Fried garlic, garlic oil, sesame oil, tangy ginger black soy dipping sauce. garlic-chive dumplings. totally vegan. steamed then fried on one side. OR just steamed OR fried on both sides. Whatever you like. we recommend on side for optimal crisp to tender flavor ratio optimization. pork dumplings pan fried and served with a soy ginger dipping sauce. minimum of 2 pieces. house made vegetarian spring rolls served with a house made yummy plum dipping sauce. minimum of 2 pieces. We put this here because sides of sticky rice really do best compliment the previous dish. rice sheet dumpling stuffed with a rainbow assortment of vegetables. Served with a sriracha peanut dipping sauce. This is an excellent vegan or vegetarian option that lacks nothing in flavor. Isaan is the region of North East Thailand. BBQ and grilling tender cuts of meat over charcoal is done curbside absolutely everywhere. Most tourists know the street food in Bangkok is good. But in my personal opinion the grilling and BBQ had in Korat is second to none. Choice of meat grilled and served with a shallot tomato cilantro salsa and sprinkle of crushed roasted rice. Side of tangy tamarind dipping sauce. Street food in Thailand is awesome and plentiful. In the South and in the East and in Bangkok there are lots of options for grilled fresh seafood served with dipping sauces and toppings and salsa-ish compliments. Served with the same salsa as above. tender pork meat balls, cilantro, daikon slices in a flavorful broth with toppings. recommended with fried shallots and a cilantro, lime, garlic, pistaccio nut gremolata. Palo is a soup broth that presents warm and aromatic herbs in the best way. cinnamon and star anise are well behaved and not obnoxious or overpowering yet offer their strength to a well balanced rich soup flavor profile. This is a perfect example of the balance of flavor so often spoken about regarding Thai cuisine. The options below come with choice of fresh egg noodle, mee kao thin rice noodle (rice noodle angel hair noodle), or egg noodle. romaine lettuce tossed with fried shallots and roasted pumpkin seeds, and green apple slices with a peanut coconut curry dressing. Tum Lagk, Laab, and Yum Zaab sections below are styles of salad in Thai cuisine. These salads are essential elements to Thai and/or Isaan cuisine. We've chosen a few to represent each style. Tum lagk is a traditional style of salad preperation that tenderizes or crushes ingredients in a mortar and pestle. Tum Som Thai with thin white wheat noodles. Laab is an Isaan and Lao style salad distinguished by the addition of crushed roasted sticky rice powder. This imparts a warm nutty flavor to these salads. At Bon Palay we additionally roast the rice with lemon grass, galanga, and kaffir lime leaf for extra aroma and flavor. Laab also typically means addition of culantro and mint. grilled and chilled tender thin slices of sirloin with mixed greens in a tangy thai lime tamarind mild chili paste dressing. Tossed with Asian herbs, diced shallot, and a sprinkle of crushed roasted rice. This salad does not yet have a vegetarian option. There is shrimp paste in the chili sauce we currently use. Grilled tender pork carved and tossed with chopped romaine and a cilantro mint herb medley in a tangy tamarind mild panang curry YUM dressing. Grilled tender chicken thighs carved and tossed with chopped romaine and a cilantro/culantro mint herb medley with extra Pak Kayang herb in a tangy YUM dressing. YUM is the quintessential Isaan tangy combination of bright vibrant fresh well balanced flavors with lime fish sauce and palm sugar. Grilled strips of japanese long eggplant tossed with shallots,tomato and cilantro in a YUM sauce. Grilled and chilled jumbo shrimp, squid, bay scallops with chopped romaine, tomato, shallot, cilantro in a YUM sauce. Shredded green mango in YUM sauce with tender fried pieces of catfish. Thai winged bean sliced and tossed with shrimp, ground pork, shallot and roasted crushed peanuts in a mild chili paste - coconut milk YUM sauce. Topped with fried shallot. Curries have choice of White wheat noodle or side of rice berry. Flat rice Noodle is also a tasty option. RED CURRY with grilled pineapple and thai basil and coconut milk. Sauteed vegetable, caramelized onion, sauteed sweet red peppers. This dish is mildly spicy. GREEN CURRY dish with Thai basil and coconut milk., grilled eggplant, caramelized onions, sauteed sweet red pepper. This curry has a slightly higher minimal heat level. It's the hottest Thai curry. Hotter yet is always an option. This is the curry which traditionally is served with the thin white fermented rice noodles. For now we are using thin white wheat noodles as a substitute. AKA This is like Thai spaghetti. BROWN CURRY dish with crispy pan fried potato slices, caramelized onion, honey roasted peanuts and coconut milk. This curry is the least spicy but higher heat is always an option. LIGHT RED CURRY with less broth and thicker than other curries. Same mild heat as red curry. French green beans, Sauteed sweet red pepper, kaffir lime leaf and lime zest. this curry paste is made with roasted coconut and has a mild heat level. This curry is also less soupy than other curries. Sauteed Sweet red peppers, shanghai choy, and Thai basil. The flavor profile of this curry is best paired with seafood. YELLOW CURRY with caramelized onions, japanese sweet potato, coconut milk. fresh rice noodles sauteed with onion, sweet red peppers, shiitake mushrooms, Thai basil in a slightly spicy to spicy and tangy sauce. essential traditional dish similar in appearance to Pad Thai with a much different sauce. This version is one inspired by one had in Palay's home town. Shallot, tamarind, miso, soy sauce and garlic chives. thin Mee Kao rice noodle with ground pork, coconut, garlic-chives, sauteed shallots, white miso, tamarind. Sauteed sweet red peppers. Shrimp or fish or seafood option only with this dish. Same as Bummee noodle soup but with the broth served on the side. More egg noodles and less broth with this option. Local regional dish with thin mee kao rice noodles. The dish gets flavor from pork, sesame, sriracha and smokey fish flakes. Excellent with mixed seafood. Dish is altered slightly from tradition version to suit available ingredients. Local village noodle dish with tamarind, shallots and smokey fish flakes in mee kao thin rice noodles. grilled sliced pork with Thai basil, onion, sweet red pepper string bean, and a side of rice berry. Ground Pork is that traditional protein for this dish. Grilled or ground chicken is also suitable. mild chili fried with fish and shrimp paste thai basil sauce. cashew or peanut, caramelized onion, roasted sweet red pepper, Thai basil (horapa), and side of rice berry. This dish is not available for vegetarian option. We eat with our eyes. Thai food can be quite beautiful when presented with care. Some uninitiated don't know what to expect. The First Three images will highlight some new items or items we thing need more attention. Thereafter its a simple scroll of pics and descriptions. Thanks for your patience while we update and improve our accessibility and general customer interface experience. Yellow curry. Similar to masaman curry but with a stronger curry flavor and less intense cinnamon. with caramelized onions, japanese sweet potato, coconut milk. mixed appetizers and small plates are a great way to share and try lots of flavors with multiple people. Thai style dining is ALWAYS family style in our experience. Pictured here are some of our home made dumplings with home made dipping sauces and grilled pork belly with a nam jim dipping sauce and very complimentary tomato salsa. Traditionally done with ground chicken. We have decided to marinate and grill instead. Tender pieces are carved and tossed with traditional laab salad herbs in a balance that best suits grilled chicken with a lime, fish sauce, tamarind dressing. We've previously done a boneless version. If you prefer one or the other ask us. One or both may be available. This one here is pictured with steak and added sweet potato slices at customers request. Bon Palay is country Thai cooking and other Asian comfort food. There are as many definitions of real Thai food as there are cooks making it. Yet still there are so many flavors and dishes not thoroughly represented. We hesitate to call Bon Palay a Thai establishment as it doesn't fit the mold and is not what foodies have come to expect. It is however, in aspiration, the type of place we would seek out when traveling. While we do offer many of the Thai items that Americans are accustomed to our focus is also on the sadly neglected everyday food that is, although less auspicious, equally delicious. This food is not spicy and doesn't have to be unless you want it to be. We can bring the heat, but only to accentuate, not to overwhelm. Great flavor absent of spice is an option. Simple dishes such as Palo are everyday essential sustenance yet fail to show up on any standard Thai menu. Dressed up or dressed down and with a little tweaking traditional everyday Thai food becomes accessible to any palate and is just as exciting as the fancier fare. We would not do a message like this justice if we didn't mention regional cuisine differences. The food we try to present here is in our experience predominantly central Thailand. Bangkok and the eastern region of Isaan (the left elephant ear), Nakhon Ratchasima (Korat) and some items from the south that have inserted their way into the Thai table mainstream. A culinary expert may beg to differ and we would enthusiastically receive all feed back within the context of this Americanization melting pot authenticity quagmire. If this over baked long winded explanation seems a bit morbido al dente its meant only to highlight sensitivity and respect for a culinary culture that prides itself deeply on preserving traditional and official flavors and methods. We know what we are... a small comfort-food shop. In our travels we've seen regional variation prove that while no one is right, good food is good food and therefor, with a tempered fidelity no one is wrong. Reminiscent of so many culinary nooks found throughout Thailand the open-kitchen dining room offers full immersion in the sound, scent and style of Thai cooking from the tap tap tap of a crock to the sizzle in a wok. While not everything is sourced locally that is ultimately the goal at Bon Palay. We do try to source items as locally as possible. That might mean fish farm raised in the mid-western United States vs. an international source. We also have a local sister farm to source organically grown herbs, vegetables and fruit using sustainable and responsible and organic methods. The farm is early in its development and is currently focused on preparing the soil and farm ecosystem for a no till to limited till system. See BrigidFarms.com soon to find out more or on the menu below check out the "What's Fresh and Local?" section in the coming 2017 season to see what is grown and/or sourced locally. This is a mixed house and as such we offer a number of western items on the catering menu. Good food is good food and as such we feel it needs no label. A number of passed down Irish and Polish and Italian family recipes round out the offerings nicely and present options for a group or a family or a couple or perhaps even an individual with diverse tastes. egg noodles, pork dumplings made in house, and asian vegetable with traditional side toppings. chicken or pork braised with aromatic herbs and mushrooms with poached egg or hard boiled egg and cilantro over rice. served with a side bowl of aromatic deep flavored broth. Thai hot and sour soup. Thai aromatic herbs simmered with a mild chili spice, lime, shallots and tomato slices with choice of chicken or shrimp. Thai sweet and sour soup. Thai aromatic herbs simmered with lime, coconut milk, mushrooms and choice of chicken or shrimp. grilled and chilled tender thin slices of sirloin with mixed greens in a tangy thai lime tamarind mild chili paste dressing. Tossed with Asian herbs, diced shallot, and crushed roasted rice. chilled glass noodle salad with citrus zest, asian herbs and spices, mixed shredded lettuce and vegetables, ground pork and mixed seafood. chicken satay as a sandwich. asian seasoned pulled pork served with banana sauce and mango chutney on a pan de sal bun. pulled chicken braised in a red miso and garlic sweet chili served with grilled corn, shredded lettuce, sour cream, shredded cheese and a red miso pan sauce in a soft wheat tortilla wrap. salmon fillet pan seared with a mild chili paste crust served with a side cup of light coconut choo chee curry, rice and lemon pepper green beans. rice vermicelli and choice of chicken or pork or shrimp with Chinese broccoli in a Thai miso gravy. 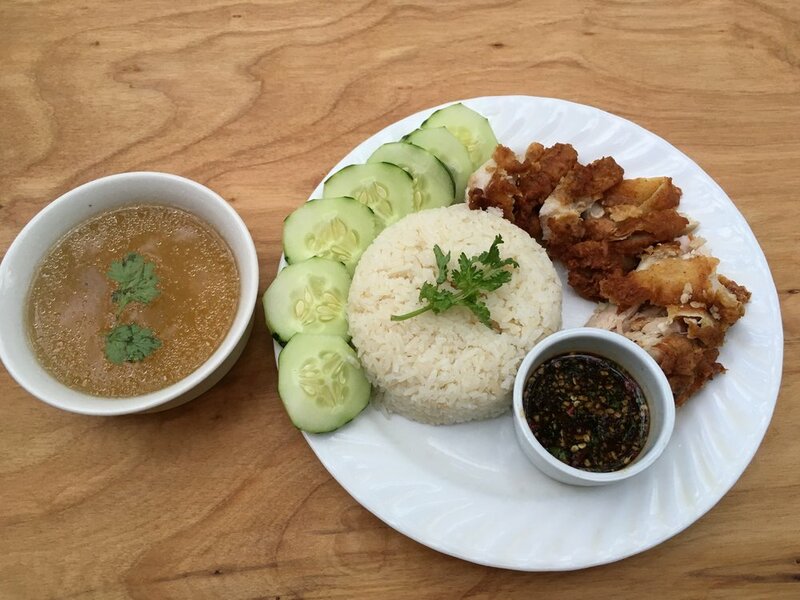 chicken simmered in broth or fried chicken or pieces of both over ginger garlic pilaf. Two dipping sauces mix or match: a ginger garlic red miso cilantro soy dipping sauce and/or a sweet chili dipping sauce . served with side cup of broth. pulled braised foreshank with a light curry sauce with sage fried rice and grilled veg. citrus glazed duck with Thai rice berry. roasted duck breast with a mild chili thai basil glaze and Thai rice berry. small plate Items available on our catering menu. These items will occasionally be available on our frequently updated in house menu. battered fried butterfly shrimp with battered fried green beans with a sweet tangy dipping sauce. battered fried butterfly shrimp with bon palay plum sauce. grilled tender calamari rings with choice of dipping sauces. the traditional spicy and sour dipping sauce may be too strong for most that are not Thai food initiated. an americanized alternative is available. shell on to preserve amazing flavor when grilled. with a citrus garlic glaze. huge asian tiger shrimp with excellent flavor. St Brigid's cross, An old Irish symbol of exalted humility fashioned in spirit from the ancient goddess known by the same name and celebrated for spring fertility, fire and song. With all its significance it isn't gilded or jeweled... isn't molded from gold or silver... remains as it was fashioned eons ago... a simple weave of grass... power in simplicity... humbleness... its not dressed up... losing meaning... adding meaning... the cross like st Brigid is a heady mix of seasoned sentiment and perennial hope... myth and timeless truth of human condition... of legend of old and spirit of new. The cross is fashioned from simple elements.... not meant for permanence except for the indelible marks on us and the reverence for the simple pleasures it represents in spring fertility, fire and song. In kind, good food, craftsmanship, and a sensory celebration of life is our approach. So too should food be... wholesomely indulgent... simple.... from simple elements and crafted with contemporary spirit. Each experience making a mark on us... an indelible impression... to expect the same again and not less maybe.... to see something new for the first time.... and to see something familiar new again. As foodies we strive to cook the type of food we would want to experience ourselves. A natural extension of that process involves growing the ingredients we want to cook with. Good food starts with good ingredients. We hope to offer items on the Bon Palay menu in 2017 that incorporate organic locally grown produce from Brigid Farms as well as from other local farms. 06-22-18 The best laid plans of mice and men so often DO go awry. The plough of powers that be beyond us can rake over ANY home. In all stature and whether by proximity of loft or of lofty ideal it seams to be that real estate is always in too much demand. Maybe in 2019 after all the nonsense emotionally antagonistic behavior equivalent to what a couple of new kids on the play ground have to deal with... maybe then we'll be able to offer something substantial AND we would love to work with others... officially calling all collaborators. Please contact us. thai breakfast in process of updating this menu now. To see an up to date menu download the pdf for descriptions and pricing. We did our trial run. we're pleased with the results. we'll be back with breakfast possibly in november. thai style breakfast table items. Khao Dtom Goiy is a style of breakfast where one gets a bowl of rice soup and orders from a list of side dishes to complement the rice soup. There are No hard rules for Thai breakfast. There are no rules at all. At home, breakfast is usually what wasn't finished the night before with some additional items and its always 'family style.' There are a few things are typically eaten only in the morning and a large morning meal is seen as critically important to health but really anything goes as to what that meal consists of. Below are some pictures of Bon Palay Thai Breakfast offerings and items. Pictured here are some items from the breakfast menu and this is what a typical spread would look like for two people. ground meat sauteed with just a touch of oil and just a touch of red curry and lots of herbs and spices. ground chicken with lemon grass, wild ginger, Thai lime leaf and just a touch of red curry. Variety of muchrooms simmered with lemon grass, Thai basil (horapa) and fish sauce. Kubocha squash pieces seasoned and sauteed with garlic and fried egg. Pictured here with Thai Basil (Horapa). While not formally listed on the menu it can be an option. Ask for availability. Japanese eggplant slices dipped in egg and pan fried. Served with the recommended awesome flavor combo of Nam Prik Kee Ga dipping sauce.